Discussions of copyright and religion are fraught with risk for the same reason; that it is extremely difficult to find middle ground. Two weeks ago, an article in the Huffington Post raised what, on the surface, looks like a clear-cut demonstration of violation of intellectual property rights. But, as is often the case with these rights, careful reading brings to light a more complex matter. The article, published on 6 June 2016, concerns the work of Vancouver photographer, Dina Goldstein. Although the Huffington Post indicates that Goldstein is seeking damages from a foreign newspaper for its use of her work, the article does not identify which body of law is relevant to Goldstein’s claim. Goldstein is entitled to be offended by the criticism levied at her; however, it is open to debate as to whether any laws were broken at all. My photograph … was deliberately manipulated into forming a criticism about parents who do not promote religion within the household. This sentiment is seething with the classic Catholic guilt trip I reject … In fact, this argument is completely opposed to my own way of raising a family, without religion. On page seven, the article begins with: “Photographer Dina Goldstein … .” The article deals with Goldstein’s work in depth, detailing highlights of the collection and Goldstein’s philosophy about the collection. In terms of crediting a creator, or invoking a creator’s work to a specific cause, these are matters of moral rights which serve to protect the personal connection between art and artist. As most readers know, the scope of protection varies. However, among observing countries, the right of attribution (acknowledging the creator) and integrity (treating the work with respect) are common. Ireland observes both (so too does Canada). But the immediate question is whether moral rights prescribe a specific placement of attribution? Irish law is silent as to how attribution should be carried out. Known as the paternity right in their Copyright and Related Rights Act, Chapter 7 – Section 107 states: “ … the author shall have the right to be identified as the author and that right shall also apply in relation to an adaptation of the work.” Thus it is plausible that crediting Goldstein through the article would serve as observant of moral rights under Irish law. The Alive! 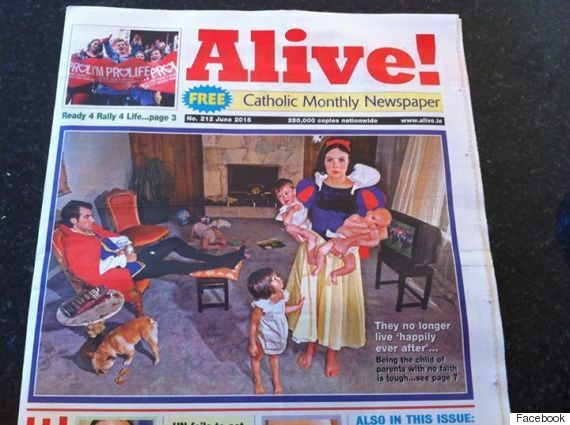 article quotes Goldstein as saying: “I am a fierce realist so I wanted the princesses to be in real life situations with problems of their own.” The article further quotes Goldstein as “raging against the happily-ever-after motif” spoon-fed to the young. Neither quotation is attributed to any particular press interview or article, but Goldstein’s website contains an extensive collection of material so it is plausible that these quotations are accurate. Alive! uses Goldstein’s work and her remarks as a background to advance their own argument; that believing in “happily ever after” is a fundamental belief, and a worthwhile one, in the Christian tradition. But is [Goldstein] raging against the Christian message of hope in the fairy stories or against the culture of despair which has infiltrated both society and her own life? She seems to think we should stop telling children stories with happy endings. That kids need to realize that real life stories don’t end that way. So is there a legitimate complaint here, and if so, what is it? Was the photograph unfairly used in a manner that is derogatory to Goldstein’s reputation? Have the musings of Alive! cast aspersions to Goldstein’s character? Or, was the condemnation of Goldstein’s work merely criticism? Criticism that necessarily required explanation and therefore invocation of Goldstein’s work? And if there is a complaint, is there an avenue of redress for Goldstein? I am unfamiliar with the sturdiness of Ireland’s regimes of fair dealing, moral rights and defamation; if an Irish reader would like to comment, please do. On a different note, Goldstein’s work is phenomenal. In an interview with Fanny Kiefer, Goldstein remarks: “… [the] characters are symbols, to convey a scenario.” Fallen Princesses is dramatic and touches a chord by the recasting of familiar characters among the all-too-real feelings of desperation that pervade life. The rude-awakening that marriage can be, the trauma of cancer, and other realities, are conveyed masterfully. With my bent for maintaining copyright as a set of limited rights (as it has been for 305 years), the best part of Goldstein’s work is this: no reprisals from the Disney Corporation. When questioned by Kiefer as to whether Goldstein had sought permission from Disney, and did Disney call upon publication of the pictures, the answer to both questions was No. Nor should there have been any reason for Disney involvement. But the persona of Disney and its ironclad grip upon its characters is legendary to the point of discouraging putative artists and even well-heeled lawyers from using Disney materials. Goldstein’s story is a happily-ever-after of an entirely different nature. I don’t think anyone could dispute that destruction by backhoe is a mutilation. The problem is that, technically, the destruction of the sculpture itself wasn’t a violation of moral rights. As indicated in the Observer story, the way moral rights have been written into law, the artist has to prove that their honour or reputation was damaged, before a claim of moral rights could succeed. Il n’y a violation du droit à l’intégrité que si l’oeuvre est, d’une manière préjudiciable à l’honneur ou à la réputation de l’auteur, déformée, mutilée ou autrement modifiée, ou utilisée en liaison avec un produit, une cause, un service ou une institution. This places the burden of proof on the artist to show the loss of reputation. Not an easy thing to do, even for established artists. In Copyright Law (2000) David Vaver makes reference to a similar case in Quebec where artists’ claims were dismissed on the grounds that if their work was out of sight, their reputation could not have suffered (p.162). A better coding of moral rights would be to follow a structure similar to fair dealing – where the onus is on the individual manipulating the work to do so in accordance with general guidelines that are respectful of both the work and the artist’s wishes. Moral rights are really about homage.